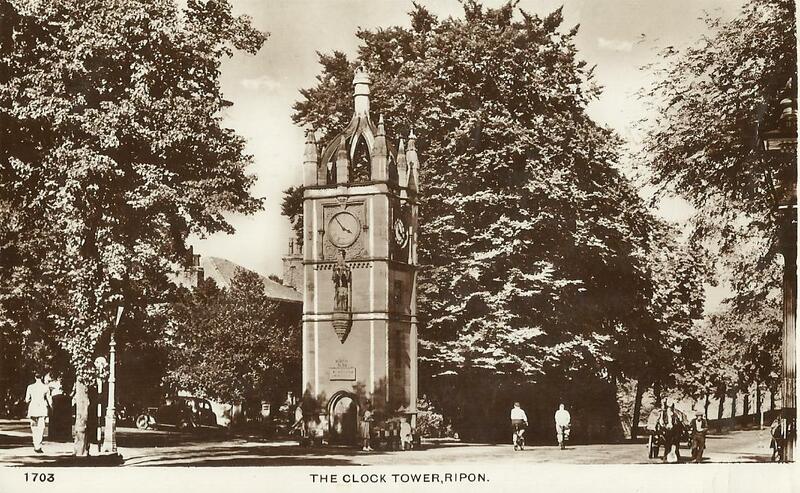 The Perpendicular style Clock Tower at Ripon was built in 1897 to commemorate the Diamond Jubilee of Queen Victoria. There is a statue of her over the doorway. The property on Park Street, Ripon, was owned by the Baynes family from 1679 until 1791 and the gazeboes may have been built by Richard Baynes. In 1719, his will referred to the burgage as 'Cupola Close'. An 18th century map does not show the terrace linking the two pavilions and it may have been built later. The Gazeboes were restored in the 1980s. The 90 feet tall obelisk, which was erected for William Aislabie in 1781, is a rebuilding of the 1702 obelisk by Nicholas Hawksmoor for John Aislabie. It is the oldest free standing monumental obelisk in England.